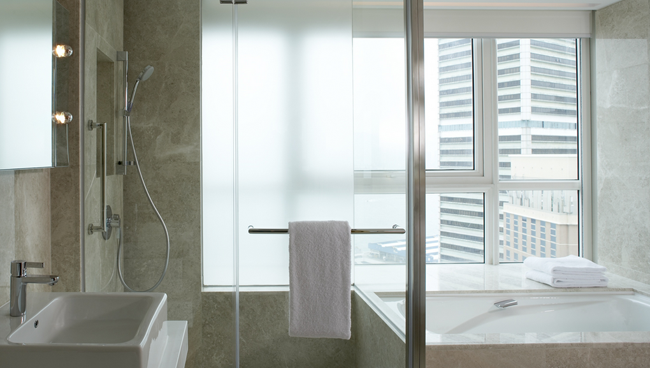 The Environmental Protection Agency is funding a grant to wirelessly track hotel guests’ shower times. Thanks to a grant from the Environmental Protection Agency, researchers at the University of Tulsa are creating devices that fit onto hotel shower fixtures. These gadgets will transmit each guest’s water-usage data to a centralized computer. One thought that may be crossing your mind: “Does this mean the hotel will be charging me for my water bill?” Somewhat surprisingly, the answer (for now) is no. The stated goal of the project is to make hotel guests consider shortening their showers from the eight-plus minute average. In recent years there was been an a lack of water and just having people be more cautious of how long they are in a hotel shower will help the environment. The new technology will allow guests to track their own daily water usage with a handy smartphone app. The idea, of course, being that people will become more conscious of their water use. At present, that’s not likely data that your average person is particularly aware of on a daily basis. While it’s not one of the stated end goals of the project, one has to assume that a water-usage fee for hotel guests will likely follow. After all, one surefire way of making people aware of something is to make it affect their wallets. EPA is not the first to fund research into a device that monitor’s shower length. Green Starts Here offers the ShowerSaver, a monitoring device for use in the shower that provides the user with real-time information on shower duration and water consumption. So, it’s not just Big Brother who wants in on intimate time, eh? Will guests voluntarily take shorter showers if made aware of the water impact they are having? The jury is still out but it will be fascinating to find out their reaction. Seeing as guests will be accessing their water-usage data through smartphone apps, add one more battery-draining activity to our mobile to-do lists. Perhaps these same hotels should also consider a cell phone charging station in the lobby.